Sliding through the constellation of Leo is a little ember of a star; a red dwarf by the name of Gliese 436. Gliese 436 is not much to shout about on its own; it is 30 light years away burning quietly at around 3000 Celsius and is only 42% of our sun’s size, making its radius about 181,500 miles across. Its not visible to the naked eye but it is close enough for you to see it through a telescope. Gliese 346b tears around its red dwarf – its year is just 2.6 earth days. Not only is the orbit very fast, but it takes the planet extremely close to its sun as well; its just 2.4 million miles away. Compare that to Mercury: the closest planet to our sun is 36 million miles away – now you start to get the picture of just how close Gliese 346b is to its star. Alongside its speedy orbit, the planet is hot… very very hot. It is estimated to be about 439 Celsius on the surface. It is also big, comparable in size to Neptune with a radius of around 16,000 miles (to compare, earth is only about 4000 miles). Perhaps more interesting than these basic features is the planet’s more unusual properties. For starters, the presence of ice; water ice. Such a hot planet would surely melt any ice which threatened to form? Not here. The theory is that due to the immense gravity of Gliese 346b, water is unable to evaporate as it normally would. Instead it is transformed into a very rare form which is able to become solid at such high temperatures. Putting a cube of this in your drink would be more likely to boil it than to cool it down. According to all the scientific models, planets as warm as Gliese 346b should have very little carbon monoxide, yet the planet has a surprising amount. It should also be home to a huge amount of methane. Gliese 346b, however, has 7000 times less methane than it should. It may smell a bit more pretty than we thought, but its really messed up our planetary models. 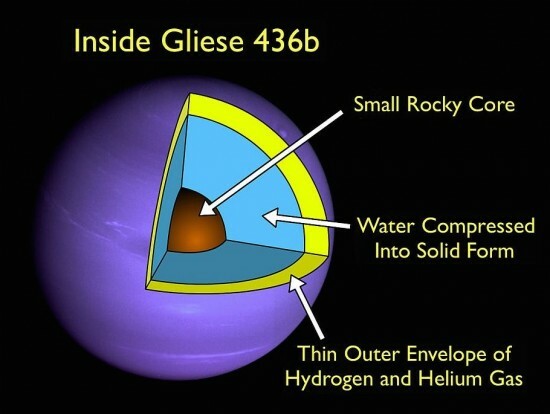 That’s not the end of Gliese 346b’s bag of tricks. Using an ultraviolet sensor the Hubble space telescope detected a huge cloud of hydrogen stretching out from behind Gliese 346b. This cloud is 50 times bigger the red dwarf that Gliese 346b orbits. The theory suggests that this cloud could hold a clue to how hot super-earths are formed; they start life as a huge gas giant but as they are exposed to their stars’ heat, the gas is slowly burnt away leaving an exposed, rocky core. This is one of the most interesting planets known to us, and we hope the discoveries will keep on coming.